Luxury Villa Poggio Secco is located in a fairy-tale setting among the gentle hillsides just south of Florence. 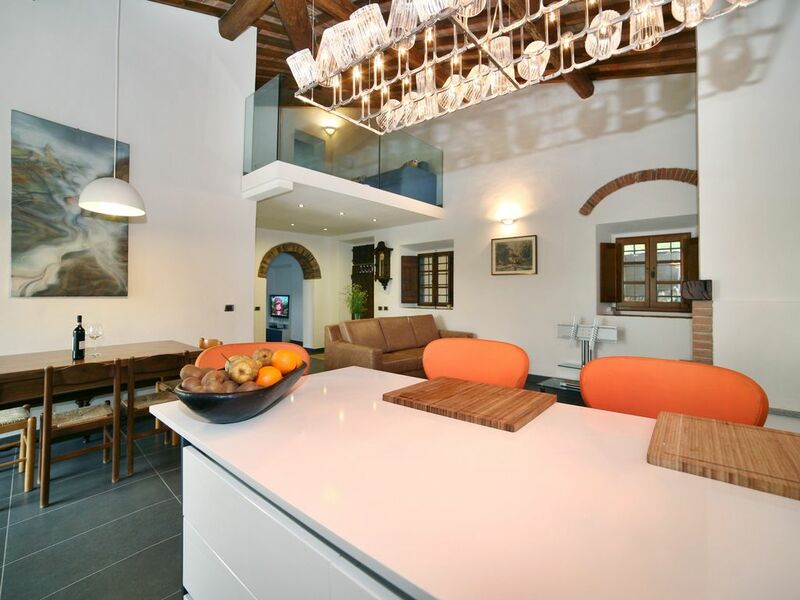 The property is set on a large plot of beauty and peace, making this villa the perfect location for several couples or an extended family seeking a holiday in close proximity to Florence. The location could not be better, set on an idyllic hillside just 15 minutes (8 km) from Florence. This elegant country house is within an hour's drive of all of the beautiful hill towns and vineyards in the Chianti area.The villa offers easy access to both the center of Florence and the Chianti region, so you can alternate trips to the Uffizi and the Duomo with excursions to the countryside of Tuscany. The closest village, Grassina is at 3km away from the property. This town has several bars, grocery shops, bakery, butcher, and a hairdresser. Riding and a golf facilities are available at 4 km. from the house. A short unpaved road (200 m) leads to the farmhouse, surrounded by vineyards and olive groves. The house has been fully restored last year and the attention to detail and beauty is remarkable. We have a large private garden with a large patio overlooking the Tuscan country side. You can enjoy sipping a glass of Chianti while barbecuing some Tuscan stake. The house is furnished with original 18th century furniture. Villa Poggio Secco boost some beautiful tiled floors and beamed ceilings, and is divided into two floors. The 3 double bedrooms all with a double beds are located on the ground floor. Plus an extra mezzanine with a private bathroom and luxury sofabed is located upstairs. Air conditioning system and underfloor heating available in the whole property. A large bathroom downstairs with a bathtub and separate shower. A upstairs bathroom with a bathtub. Large open plan kitchen with dishwasher, oven, microwave and many other luxuries. Large Living room with fireplace and a sofabed. Tv room with access to the upstairs mezzanine with sofabed and bathroom. The villa has its own two private parking spots and private driveway. All towels linen and cleaning of the flat included in the price. Parking available in front of house, no stairs present, this allows for an easy access to this property. 450 square meters garden with a large patio which includes a barbecue, table and chairs. The house also has Wifi. My Name is David, I work as an Osteopath in London. I was born in Spain and brought up in Florence. This property is been in hour family for many years. You are really near Florence but can still enjoy been in the country side. A large bathroom downstairs with all luxuries. Large table in front of a lovely French door. Accessibility Parking available in front of house, no stairs present, this allows for an easy access to this property. A full self explanatory manual is provided for all guests. Keys will be handed on arrival to all guests. Cooking and cleaning services also available on demand (extra charge). Great location, recently updated and an on property maid. Stunning views and it comes with its on royalty. My family of six adults had a wonderful stay in the Florentine hills. The home was comfortable and relaxing for all of us. The surrounding countryside was stunning, too! David was always available for questions and sent us excellent directions and instructions for our stay. We were even allowed in early as there had been no renters there that morning. Negotiating the roads to get to the villa was an adventure if you're not used to driving in rural Italy, but we had fun! Our housekeeper met us upon arrival and did her best to give us a walk-through despite the language barrier. She also checked on us during our stay to see if we needed anything. We would highly recommend this property to anyone looking for a Tuscan getaway! What a beautiful place! Exactly as pictured and described. 20 minutes from Florence so a car is a must. Beautiful. Off the beat and path. Must have a car. Such a charming town. Home is so beautiful and so relaxing. The yard was stunning. We had a wonderful time in this beautiful villa. The location just south of Florence was ideal and the views breathtaking. There were 9 of us and we all were very impressed. You can park your car for free close by and take the bus into Florence. We even used the grill one night and had our own bistecca! Will recommend to friends and will stay here again when some day hopefully we are back in Tuscany! Hi, We had a great time at David's property outside of Florence. It was a 4* rating as a general consensus between 3 people. Pros: The location was fabulous and so was the villa itself. The views were breathtaking and the patio was incredible to sit on every afternoon/evening. Very modern and clean! Room for improvement: The villa did not contain any "book" of local information encountered on every other vacation rental i've been to. We had a tough time googling nearby places to eat etc....The other piece that could be improved is the person greeting us on arrival only spoke spanish. 2/3 of us were ok with it but the third person could not understand anything she told us. The master bed was also not very comfortable. It is a memory foam that is starting to wear out. My wife and I sagged toward each other in the middle each night. Note: We would absolutely return here but there were a few items keeping us from giving it five stars. Our recommendations: Park at the Piazza Michaelangelo for easy access into Florence and make sure you eat at the Osteria Bruciategami restaurant in Bagno Al Ripoli. Villa Poggio Secco apartment is located just 5 km from the the center of Florence, a place with ancient roots and surrounded by the hills of Impruneta, Greve in Chianti, Bagno a Ripoli, San Casciano Val di Pesa and Scandicci. Florence is a place you must visit if you come to the area on holiday. Drawn by its incomparable artistic and cultural heritage, the city attracts visitors from all continents. You have a sense of the importance of Florence through the age walking between magnificent Renaissance buildings in its historic center where one can admire landmarks such as the Duomo, the Basilica di Santa Croce, Ponte Vecchio, Accademia dell’Arte and the Uffizi Gallery. Some localities in the surrounding areas are also of interest, for example Greve in Chianti, Volpaia, Castellina in Chianti, Radda in Chianti, Gaiole in Chianti, Panzano in Chianti. The main attraction of these towns are the terracotta and wine making. Most of the terracotta kilns can be found going down from Impruneta's main square towards via Chiantigiana, along via della Fonte. Among the many products you will find a display of the very large orci, pots that once were used to store olive oil and that nowadays are used in gardens and in the atriums of the magnificent villas of the surrounding areas. A visit to the Chianti area means you must have a sampling of the locally-produced wine which is famous the world over. The curious traveler will appreciate the hospitality of the local farmers who will help him discover the qualities of the 'Chianti dei Colli Fiorentini', that can be sampled with some Tuscan bread sprinkled with an excellent extra virgin olive oil. From an artistic point of view, you must visit Chiesa (Basilica) di Santa Maria all'Impruneta and also the museum next door. It dates back to the 11th century but was restored during the Renaissance period. It now houses important works by Michelozzo and Luca Della Robbia. Moreover, there are particularly interesting villas along Via Imprunetana. The nearest airports are the Peretola in Florence and the G. Galilei of Pisa. Once you get to Florence, continue as above.